The harmonic balancer has three parts. 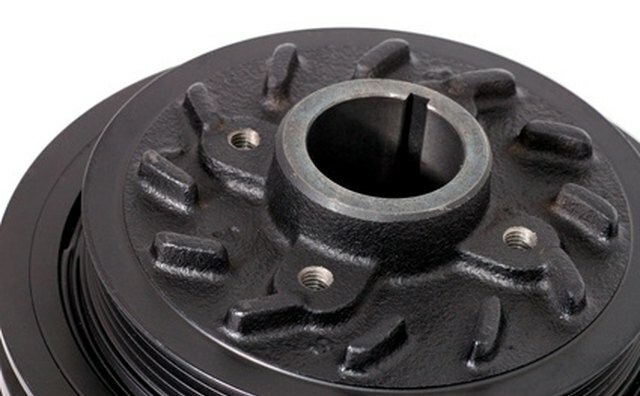 The inner part is made of molded steel with a hub that bolts onto the crankshaft. The harmonic balancer has three threaded 3/8-inch holes that are used to pull the balancer off the crankshaft. 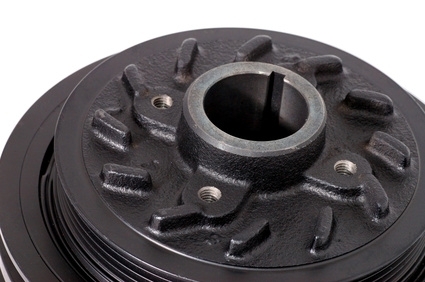 A rubber insulator separates the third part from the hub. The last part, the fan belt, goes around the outer ring. Without the harmonic balancer, the engine, pistons, rods, and anything else that attaches to the crankshaft would vibrate. The harmonic balancer keeps this vibration out of the engine. Start your engine and check the harmonic balancer to see if it wobbles while the engine is running. Take a flashlight and shine it directly onto the balancer to see if it goes in and out while rotating. If it wobbles, the harmonic balancer is bad. Turn off the ignition. Remove the fan belt then grab hold of the outer ring on the harmonic balancer and try to move the ring in or out. If the ring moves in and out, the harmonic balancer is bad. Inspect the rubber insulator between the inner hub and the outer ring. If the insulator is cracked, showing signs of wear or is missing, the harmonic balancer needs to be replaced.